So far this year, I haven’t been writing many posts, as I decided to discontinue many of the series that I started last year. I have therefore decided to start a series Trove Tuesday. 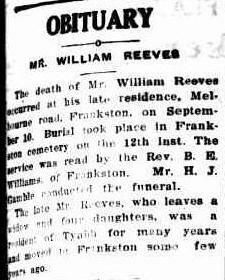 This week, I have decided to have a look and see what information I could find for William Reeves, the brother of my great grandmother, Mary Reeves. General Notes: He was the informant at his father’s death in 1888. He was living at Major Line Kooreh. Back in January, I found a death notice for William. service was read by the Rev. B. E.
Williams of Frankston. Mr. H. J. In 1912, he was an orchardist at Tyabb. 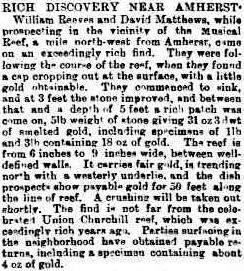 William Reeves and David Matthews, while prospecting in the vicinity of the Musical Reef, a mile north-west from Amherst, came on an exceedingly rich find. They were following the course of the reef, when they found a cap cropping out at the surface, with a little gold obtainable. They commenced to sink, and at 3 feet the atone improved, and between that and a depth of 5 feet a rich patch was come on, 51b weight of stone giving 31 oz 3 dwt of smelted gold, including specimens of 1lb and 3!b containing 18 oz of gold. The reef is from 6 inches to 9 inches wide, between well-defined walla. It carries fair gold, is trending north with a westerly underlie, and the dish prospects show payable gold for 50 feet along the line of reef. A crushing will be taken out shortly. The find is not far from the celebrated Union Churchill reef, which was exceedingly rich years ago. Parties surfacing in the neighborhood have obtained payable retnrns, including a specimen containing about 4 oz of gold. William John Reeves, death certificate no. 11591 (1888), Registry of Births, Deaths and Marriages, Victoria, Melbourne, Victoria, Australia. Registry of Births, Deaths and Marriages, Victoria, comp., Pioneer Index Victoria 1836-1888 Indexes to Births, Deaths and Marriages in Victoria, Digger CD Rom ISBN 0 7311 5300 6. (Melbourne, Victoria, Australia: MacBeth Genealogical Service, November 1998), Registration no 9149 of 1859. Email message from Douglas Wilkie to Lois Willis 28 May 2006 – family tree for Reeves family attached. Victoria, Australia Registry of Births, Deaths and Marriages, <i>Death Certificates</i>, death certificate 11591 (1888), William John Reeves. Registry of Births, Deaths and Marriages, Victoria, comp., Death Index Victoria 1921-1985 Index to Deaths in Victoria, Digger CD Rom ISBN 0 7311 5302 2. (Melbourne, Victoria, Australia: MacBeth Genealogical Services, December 1998), Registration no 9650 of 1929. Frankston Cemetery Inscriptions – microfiche held at State Library of Victoria. Registry of Births, Deaths and Marriages, <i><i>Federation Index Victoria 1889-1901</i>. CD-ROM database</i> (Melbourne, Victoria, Australia: MacBeth Genealogical Services, August 1997), Registration no 31 of 1897. Registry of Births, Deaths and Marriages, Victoria, comp., Death Index Victoria 1921-1985 Index to Deaths in Victoria, Digger CD Rom ISBN 0 7311 5302 2. (Melbourne, Victoria, Australia: MacBeth Genealogical Services, December 1998), Registration no 19264 of 1940.